Teachers have a pivotal role in securing positive experiences for people with learning disabilities. Many teachers don’t have the skills and resources they need to support pupils with learning disabilities. Testing and attainment structures do not reflect the potential of children with learning disabilities and how they can succeed. Transition periods are particularly challenging for people with learning disabilities. There are a lack of appropriate choices for people with learning disabilities at school and college. Support the early years development of children with learning disabilities, including ensuring the needs of young children with learning disabilities are reflected in the implementation of The Scottish Government’s Play Strategy. Work in partnership with Education Scotland, the Association of Directors of Education, local authorities, and other leaders on awareness raising to stimulate cultural change within our schools to improve the experiences of pupils with learning disabilities. Work with students, colleges, Colleges Scotland, College Development Network and the Scottish Funding Council to identify examples of best practice within the further education sector, with a particular focus on activity that supports progression to employment and promote the adoption of these across Scotland. Help to promote the Independent Living Fund (ILF) Scotland's Transition Fund, to ensure that young people with a learning disability are aware of and encouraged to access support to enhance their independent living, including access to further education and employment. 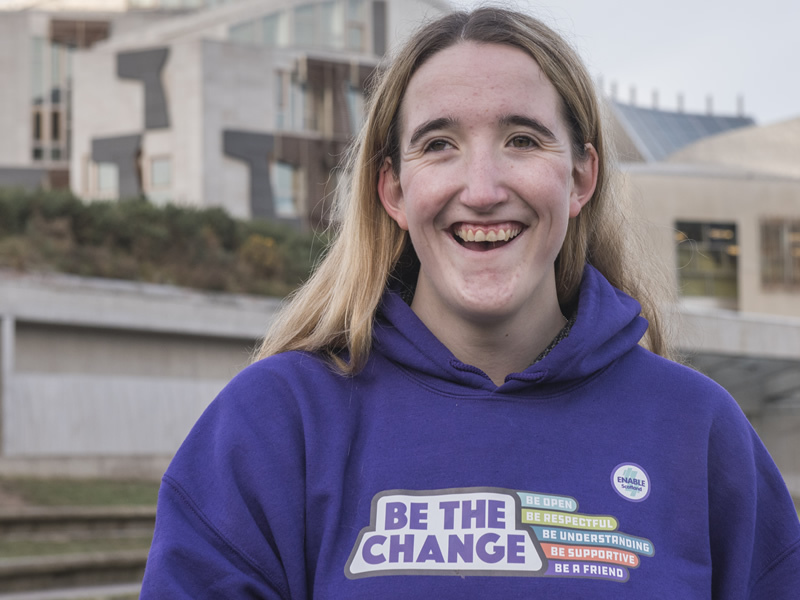 Lucy McKee is an ENABLE Scotland Youth Change Champion who plays a leading role in the organisation’s campaigning work, which has benefited greatly from her real life experience. Over the years, Lucy’s confidence has grown tremendously, and she has spoken publicly about her personal experience of bullying during her time at school. She has become a role model for many young people in Scotland, acting as a positive voice to the media, politicians and a variety of different organisations across Scotland.